This is our free software to help homebuilders and renovators to make key design decisions. Märraum has created a free download to help homebuilders and renovators. Why? Because everyone has different tastes and opinions when it comes to design. What floats one person’s boat won’t necessarily work for another, whether that’s about the size of a bed, the type of wood used for a door or the material used in flooring. Personally, I know the dimensions of the smallest bedroom I would be comfortable with to house a king-size bed. I know the minimum space I can get away with to create a compact ensuite, and the minimum comfortable size for a shower tray (1200 x 900mm if you’re interested — critical to enjoy my morning shower!) I’m confident in choosing the right wall or floor material or the style of a staircase. They’re all easy decisions for me because I know just how I feel about them. But I also know that just because they are my choices, they may not be yours. And this is not a problem – far from it — I consider it one of the absolute joys of my job that personal taste feeds the spaces I design. When going through the design process at Märraum, we want to fully explore precisely what every client is looking for. Shall we go for 1.2m between kitchen worktops, or would you prefer 1.5m or even 1.8m? For a lot of people, the response is ‘I don’t know, what do you recommend’. But should we be making that decision for you? Wouldn’t it be better to make it yourself? Our new Virtual Architectural Showroom is the first step on that design journey. Märraum were the first in Cornwall to use virtual reality (VR) technology as standard in our design process. When we work with you, you’ll be invited to our office to step inside your proposed space and take a look around using our VR headset. Our new Virtual Architectural Showroom brings the first part of that experience into your home. Begin exploring technology that will ultimately give you the confidence to answer key design questions yourself. You can download and use it for free on a mobile device or desktop, or using a google cardboard viewer (which costs about £6) for a virtual reality experience. 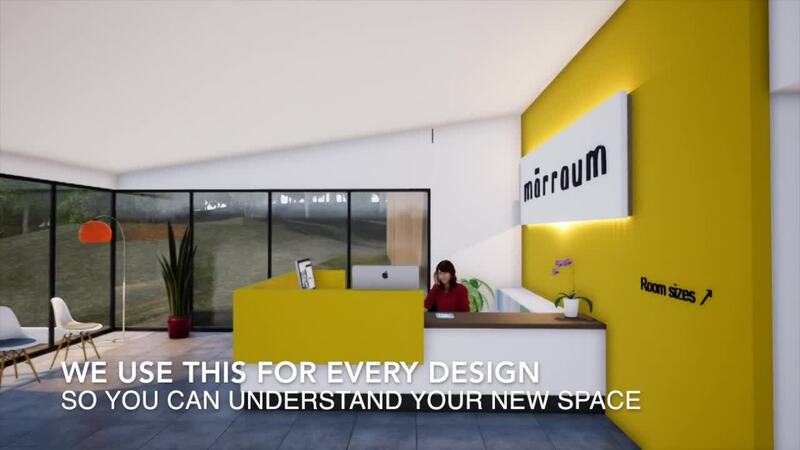 Hundreds of hours of careful consideration and development by the Märraum team mean our new Virtual Architectural Showroom offers an experience that has been designed to help homebuilders and renovators to make important design decisions within a project. There aren’t many places you can go where you can step into multiple different room shapes and sizes to find out if they feel comfortable for you. At the end of the day we always aim to make the most of your money - but if you always opt for the biggest room that may not fall within your budget. In this case a compact kitchen layout may allow for a larger living room and comparing these two options side-by-side may help you make this compromise. The Showroom can also help you when choosing materials. Take the opportunity, for example, to stand next to over a dozen different railings, helping you decide which you’d prefer on your new balcony. When you visit us at our Penryn offices, we then elevate that at-home experience to the next level, showing you your own designs in a high-rendered virtual world using our top of the range technology and software. It’s all part of the Märraum service. To download your free at-home Virtual Architectural Showroom you’ll need to download two things: our Architectural Showroom file and a BIMx application to view it, which we’ll talk you through. Click on the yellow button to get started.